Maps Compare is a website with four different on-line map services on one page. The site places Google Maps, the Google Earth browser plugin, Yahoo Maps and Bing Maps beside each other, which can be quite useful if you want to compare the map coverage provided by each provider in different locations. You can control all the maps on the page directly from the Google Map. It is quite a cool interface, I especially like being able to control the Google Earth plugin from the Google Map. The page was created by Hussein Nasser, who has written a comparison of Google Maps and Bing Maps on his blog. If you like this you will probably also be interested in Where's the Path. Where's the Path does the same kind of thing with Google Maps and Ordnance Survey (UK) maps. Which is very useful if you want to find public footpaths and other data not shown by Google Maps in the UK. If that doesn't float your boat then Dual Maps might be more your thing. 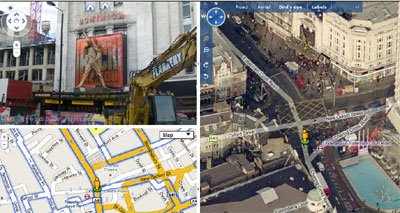 Dual Maps has Google Maps, Bing Maps and Google Maps Street View all under one control. What's more Dual Maps allows anybody to make their own map that includes a Google Map, a Google Maps Street View and a Virtual Earth Bird's Eye view of the same location. Once created you can then embed the map in your own website or blog.